The Great Giving Bear has red fur, a kindly-sounding, older voice actor, a present symbol on his tummy, and a flying machine (a balloon), and he travels all over Care-a-Lot to give gifts to everyone who cares (checked on a list). No two ways about it, they invented Santa Bear. 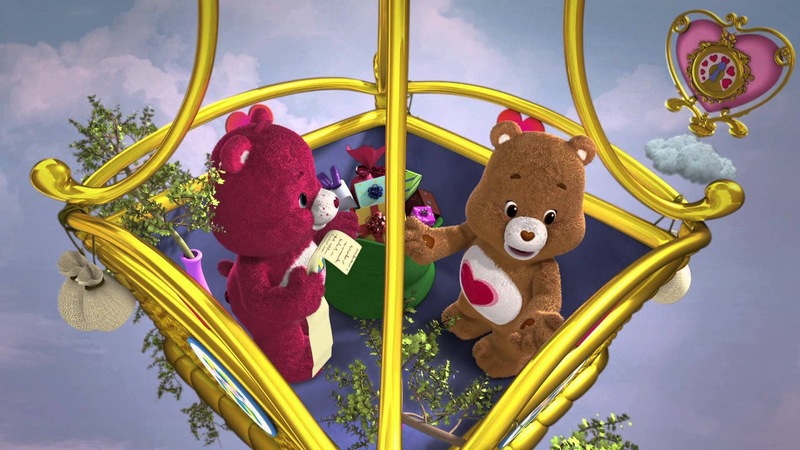 The plot of the episode is that Tenderheart is going to help the Great Giving Bear deliver gifts. But he eats some honey-laced holiday desserts, and his honey allergy causes hiccups. The hiccups cause his ability to teleport (that’s new) to go haywire. If he can’t control it, he won’t be able to help deliver the gifts. 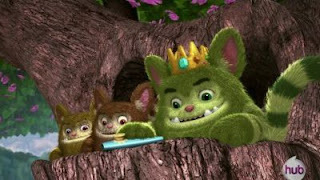 The rest of the characters try to help him stop hiccuping, and Beastly tries to keep it going by secretly giving him more honey. The Great Giving Bear eventually gets involved after an impassioned speech from Wonderheart Bear about how the holiday is about caring, not about gifts. It’s a little convenient that those kinds of speeches always end up with characters getting the gifts they claimed weren’t important, but that’s most children’s entertainment for you. Anyway, everyone gets their gifts, even Beastly, and Christmas is saved. I might not have known that the fluffy green cross between a pillow and a raccoon was meant to be an update of Beastly if I hadn’t read about this series before turning on the episode. He used to be the ineffective, bumbling sidekick to a villain who’s intended to be scary. Now he's become the main villain, but he’s still bumbling and ineffective. No one seems to be scary in this show. The vehemence with which Wonderheart explains that Share Bear cares so much and Tenderheart just has to let her make it up to him by baking new cookies sans honey was a little intense and weird. LET HER CARE FOR YOU, TENDERHEART. OR ELSE. Of course, I don’t know why the other bears don’t already know about this allergy. It seems like it would have come up. It’s the next morning, and all the bears wake up and start enjoying their gifts. This episode did more with the individual bears’ personalities, and that isn’t a good thing. Harmony Bear tries to get everyone to stop playing around long enough to help her with the Great Giving Day pageant. Apparently every year they tell the story of the first Great Giving Day, when a gift was given from the heart, inspiring more and more caring. For some reason, none of the other bears are super jazzed by this idea when they have new apparently-magic gizmos to play with. In desperation, Harmony goes to Tenderheart, but he’s too tired to help after helping the Great Giving Bear all night. Instead he gets her a kid. Literally. He uses a rainbow to kidnap a kid, who just goes along with the idea that he’ll help the bears with their pageant. However, Ethan, the kid, is a stage hog and prima donna, and soon kicks all the bears out of their own pageant in favor of his own story about a boy with super powers who flies into space to save the Care Bears from an asteroid by himself. Wonderheart is the only one still helping by showtime, and despite her best efforts, Ethan’s attempt at a one-boy show is basically a disaster. Eventually the bears save him from total embarassment and quickly throw together the pageant they meant to have. He apologizes for trying to take over, and they put on his version as well. The Great Giving Bear says they did good. You're supposed to think that Ethan learned some sort of lesson, but frankly, the lesson-of-the-episode shtick was neither compelling nor believable in any way. Sorry, one more side note. Wonderheart is super weird to me. She’s a little kid bear, with a head that’s too big, and she’s introduced as Tenderheart’s niece. I have two issues with this. 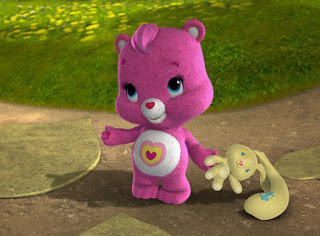 First: since when do Care Bears have any kind of familial relationships? They always seemed to be manifestations of the good in the world or something. They don’t have relationships or children. (We’re ignoring that Swift Heart is the niece of the White Rabbit in Care Bears in Wonderland, because that just opened up more questions than it answered. Also, there's no reason to think that Grams Bear is literally anyone's grandmother.) Second, it used to be common that niece/nephew relationships were used in animated properties to establish relationships where an adult had responsibility for a child, but wasn’t a parent and didn’t have to have a romantic partner or a backstory. See Huey, Dewey, and Louie for the most well-known example. However, that doesn’t fly in 2018. Kids have parents, or had them, and a well-written show is going to reckon with that. See the new Ducktales series. Wonderheart writes you into a corner. You either have to establish who her parents are and why they aren’t here, which also establishes the possibility for romantic entanglements and children among the other bears, or you have to give her some sort of found-under-a-lettuce-leaf backstory, and she’s been adopted by Tenderheart. Which would make her his daughter, not his niece. Or you could ignore all the issues you’ve just brought up, but that would mean the show remains nothing but vague, inoffensive pablum.